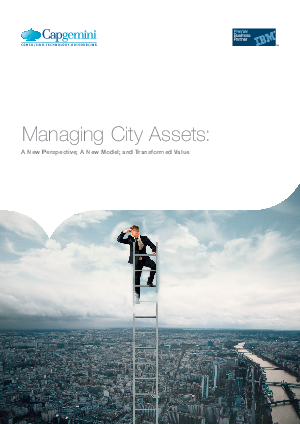 "The potential to manage assets more efficiently, replace and upgrade them, and exploit them for purposes beyond their initial role, is significant in all cities in today’s world. However, technologies that support asset management in cities are numerous, fragmented and often inadequate. For any individual city agency, the level of cost and effort required to make improvement may seem daunting. This white paper highlights how Capgemini can help cities to become ‘smarter’: It describes how to offer to city agencies a leading practice asset management technical solution provided as-a-Service. This accelerates implementation, substantially removes funding hurdles, ensures an ongoing quality solution and incentivizes cities to migrate from a fragmented, costly and inadequate model to a common leading-edge solution."